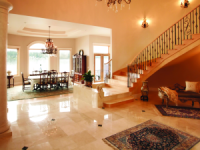 We are the Marble Cleaning, Polishing, Repair, Sealing, Restoring, Maintenance experts in the Salt Lake City Utah area. We love marble. We have worked with every kind of marble under the sun, so we understand and appreciate its unique characteristics. We are passionate about restoring your stone, and we are committed to giving you the information you need to keep your marble looking its absolute best. All marble needs care and maintenance. Your marble’s individual needs will largely depend on where it is used— floors, walls, countertops, vanities or shower walls. Marble is generally a softer stone and comes in many colors with unique and beautiful veining. Some marbles are harder and tougher than others. However, marble will scratch, etch and lose its shine and luster if not maintained properly. It needs love and attention to keep it looking its absolute best. If you have a polished marble floor, wall, countertop vanity or shower that has been damaged, become etched, or lost its shine and beauty, then it’s time to call in the pros! Stone Surface Specialists are professional marble restoration contractors serving Salt Lake City and all of Utah. We will repair, refinish, protect and restore your marble, limestone, travertine, saturnia or other natural stone back to its original glory. If you have marble with a matte or honed finish, it, too needs proper care and maintenance. A marble with a matte or honed finish should be periodically cleaned and re-sealed by a professional. At Stone Surface Specialists, we not only take care of this for you, we can give you all the information you need on the proper care you should use in cleaning your marble. We also offer a full line of Care Products to assure you are using the proper cleaning product that will give your marble the beauty you desire.